Tulips are my favorites! thanks for posting the Amy Lowell poem, too. I love tulips and I've been buying at least one (and sometimes two) bouquets a week to brighten Linderhof during the winter. Mine are getting ready to bloom in the garden and I can't wait!!! Your tulips are lovely and I adore the poems as well. Beautiful tulips. I love the poems - I just never know where to find them. The tulips, daffodils and lilacs are what I miss most now that we are in Florida during the spring. Of course, they are having a nor'easter today so I will buy tulips at the market. Your French tulips are gorgeous, and the poetry just as beautiful. Lovely post! Your tulip bouquets are gorgeous, Maggie. So full of life and color. I really like that Amy Lowell poem as well. Love the rich colors of these tulips!! I am enjoying tulips while I can still get them!! The tulips are such gorgeous colours. I looked for some a few days ago and there were just a few withered primroses and two single pansies. The snow is melting finally but we have a long way and tons of snow to go. They are so beautiful! 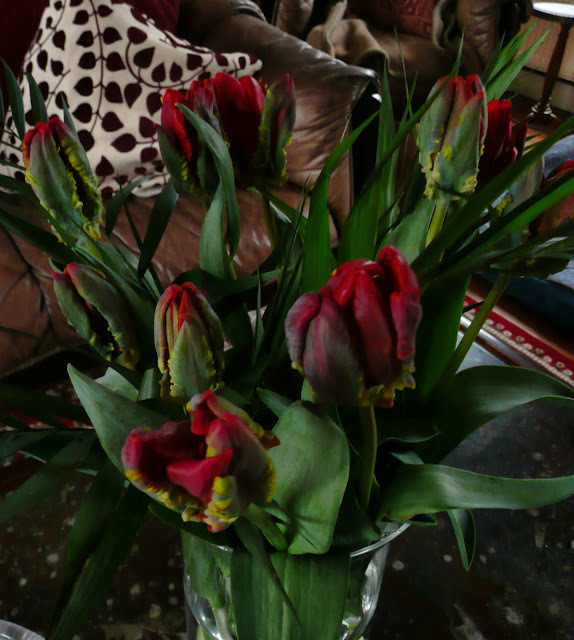 I looked a some tulips today, but there were only plain red ones left, and I wanted lots of colour, so I left them. I loved looking at yours! 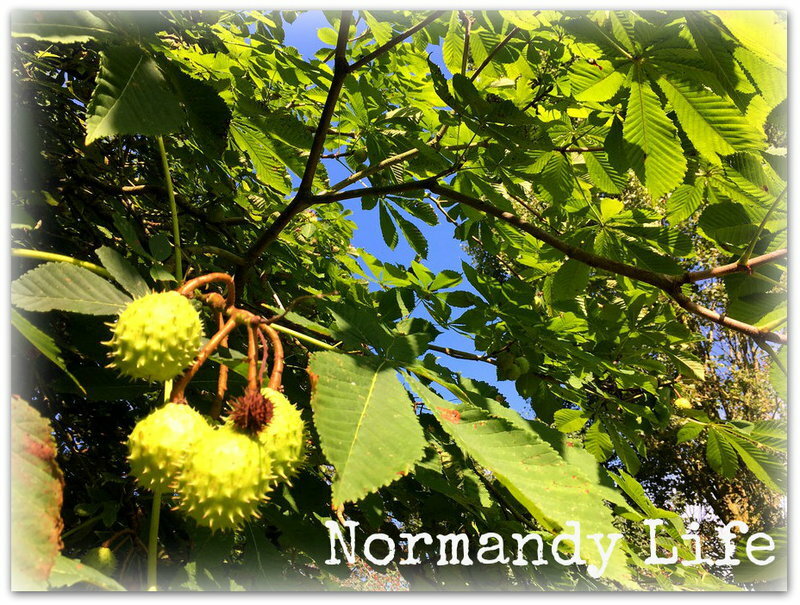 I'm happy to discover your beautiful blog. I LOVE tulips! Can't get enough of them and probably one of the reasons I like this time of year! 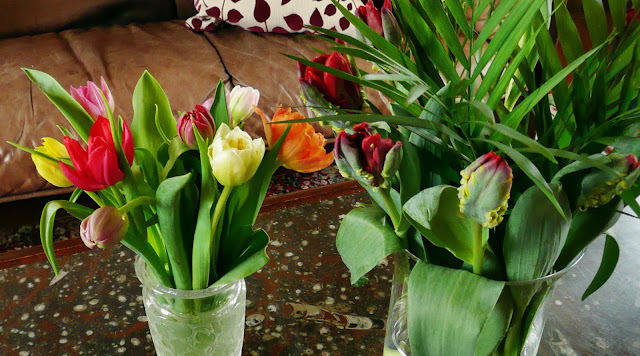 Your photos are convincing me that I NEED to purchase a bouquet of tulips! :)) Spring is taking its own sweet time to arrive here in Ontario. Oh so pretty!! Tulips just say spring to me. Loved the poem too! The tulips are so vibrant and beautiful! Tulips as soldiers in that poem is so perfect! 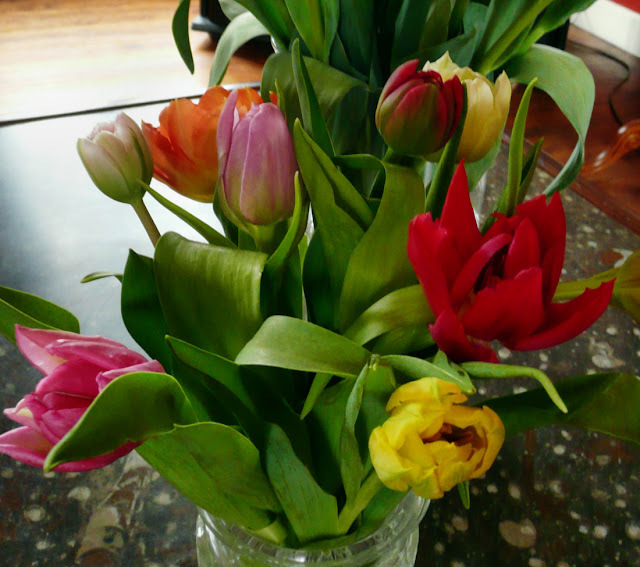 Thanks so much for bringing your tulips to Seasonal Sundays.They certainly shout SPRING!